Waco, TX: On or about September 25, 1973, I was enrolled in a doctoral course that met from 7 p.m. to 8:30 p.m. at Baylor University two nights a week. After class, I was driving west going home when I noticed a bright light above Lake Waco. At first, I thought it was the planet Venus; but as I continued to drive toward the Lake as I lived on the west side of town, I could the light appeared more and more to my right. So knew it wasn't but was probably a helicopter. Two nights later as I was driving home from class, I noticed the same light again. Since as I wasn't sure if it was a helicopter or something else, I thought I would check it out. Instead of going home, I drove over the bridge at Lake Waco and took the first exit to the right which led into Speegleville Park. I could see the craft was over the west side of the Lake in a stationary position with a white light pointing east. As I approached the craft, it turned off the light and started moving to the southwest. I could tell it was a black triangular craft. It crossed over the highway, and I decided to follow it. I got back on the highway and watched the craft cross over the highway and settled behind a clump of trees on the south side the highway. I then took the next exit and crossed over on an overpass to the area where I saw the craft go down. As I drove slowly past the trees, I could not the see the craft. The road curved back to east; and I pulled up about 100 yards, turned off my lights but left the engine running. Looking in my rear view mirror after a few moments, I saw the slowly rise from the trees and started coming toward where I was parked. It then pulled up to where I was on the other side of the fence. It turned facing me and stayed motionless, making no sound. It was on the other what appeared to a telephone line about 10 feet above it. I could definitely tell that the craft was black, triangular in shape, about 20 feet wide and 30 feet long. It had a cockpit with a greenish hue inside, and I could see the shadows of 3 small heads peering down at me. After about 4-5 minutes, a green light shined down on my vehicle, causing the engine to die. I tried to restart it to no avail. I tried turning on my lights and then the radio; but nothing worked. Getting nervous, I locked my doors. I sat there a good 15-20 minutes, trying every 2-3 minutes to start my engine. Finally, the engine turned over, and I drove down the road about another 100 yards where I turned on my lights and turned around. As I drove past the craft on my left, it hadn't moved. When I got back on the highway heading east, I could see it was still there. About 3 years later, I saw what appeared to be the same craft above the lights at the south end of the La Vega football field, apparently observing a football game. My family and I were headed toward my wife's family for dinner. And I wanted to drive over and show her what I had seen years earlier; but she didn't want to go. According to a Facebook post that recently went viral, a man devastated by the death of his girlfriend grew very attached to a 10-foot cobra which he believes is his lost partner reincarnated. For the last couple of years, the two have been inseparable, doing everything together, from watching TV to going to the gym. 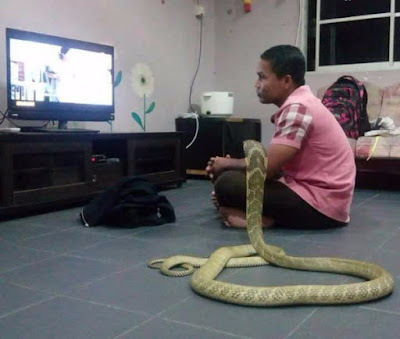 The bizarre story was originally posted on the Facebook page of one Worranan Sarasalin from Kanchanaburi, Thailand, along with a set of photos of the man and his beloved cobra in various circumstances. Sarasalin, who covers a variety of local news stories on a daily basis, claims that the unnamed man developed an unusual connection with the large reptile after noticing a “Striking resemblance” to his deceased girlfriend and becoming convinced that she had come back to life as the serpent. “He never stays away from the snake . He takes it everywhere he goes or even while he’s sleeping,” he added. Apparently, people have been trying to warn the man about the dangers of living with a loose cobra, but he doesn’t seem too concerned about being bit. “He’s well known to be the man who lives with a snake. He has been warned several times that it is dangerous but he still carries on,” Sarasalin claims. Police conducting an investigation found exotic and dangerous animals at a home in Houston, Texas, where a woman lives with her 14-year-old daughter. Houston Police Department officers said they were sent to investigate 34-year-old Trisha Meyer’s home after she tried selling a Savannah kitten to a man in California for $3,000, but never gave him the kitten after receiving the money. When officers arrived at the home, they found several wild animals all roaming freely inside Meyer’s home, including three tigers, a cougar, a skunk and a fox, police said. They also found Meyer’s teenage daughter in the home during that time, police said.